November 20, 2018. 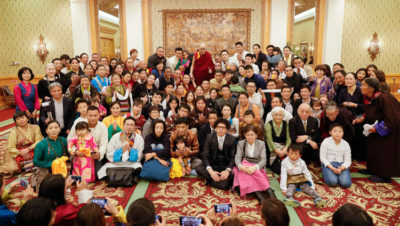 Tokyo, Japan – Speaking to a group of about 300 Tibetans and Bhutanese who had come to see him at his hotel today, His Holiness the Dalai Lama told them that he was on a short visit to Japan. He mentioned archaeological evidence of human presence in Tibet 35,000 years ago. He speculated that if theories of human beings originating in Africa and spreading out across the world from there were correct, they might have reached Tibet before China. Traces of ancient agriculture in Western Tibet might support this. “Although the Jowo statue was originally brought to Lhasa from the Chinese capital of Xi’an, when it came to improving the Tibetan script it was modelled on the Indian Devanagari,” His Holiness observed. “Similarly, seeing a need for an authentic source of the teachings of the Buddha, Trisong Detsen again turned to India and invited Shantarakshita from Nalanda University. The tradition he introduced was not concerned with prayers and rituals but with study and analysis. Shantarakshita encouraged the translation of primarily Sanskrit Buddhist literature into Tibetan so Tibetans could study in their own language. “There were Chinese meditation masters who asserted that study was unnecessary. They held that meditation alone was a sufficient cause of enlightenment. Shantarakshita recommended that his student Kamalashila be invited to challenge this point of view, which he did successfully. “Much later Drepung Monastery was referred to as a second Nalanda because of its qualities as a centre of learning. The founder Jamyang Chöjé, Tashi Palden predicted that scholars superior to him would appear in the future. Abbot Kunkhyen Legpa Chöjé dreamt of the ‘Tenma’ bringing a Lama to Drepung in a palanquin, which seems to have been a premonition of the arrival of the 2nd Dalai Lama. Gendun Gyatso contributed to Drepung’s development. He established the Ganden Phodrang there and in due course became Abbot of both Drepung and Sera. 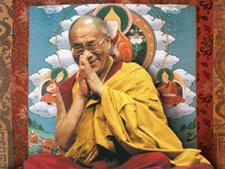 “Buddhist studies on the basis of reason and logic are found only in the Tibetan tradition. You Bhutanese may call your language Dzongkha and the Trans-Himalayan people call it Bhoti, but it is written in the same script that the Tibetan Kangyur and Tengyur are written in. These collections of the words of the Buddha and treatises of subsequent Indian Buddhist masters contain a wealth of knowledge of the workings of the mind and emotions, which is important to preserve because it remains crucially relevant today. “I have been encouraged by the resolution of peoples from the Trans-Himalayan region to work to ensure that monasteries, nunneries and temples in the region be transformed into centres of learning. Not only are monks and nuns studying seriously, but lay-people, sometimes elderly lay-people too. His Holiness then drove to the Japanese parliamentary complex nearby where he was welcomed by members of the All Party Japanese Parliamentary Group for Tibet and escorted inside. The MPs told His Holiness they would like to inform him of their plans, discussions they have held and a resolution they have reached. They were keen to contribute to the preservation of Tibetan culture, language and religious traditions which are part of the Tibetan identity and which are being suppressed by the Chinese in Tibet. They also expressed interest in supporting economic and educational development inside Tibet. They stated that they have appealed for the release of Tibetan prisoners of conscience, many of whom have been punished for defending their identity and culture. The MPs consider that all nations across the world have a responsibility to defend and support the rights of Tibetans. “Here we are in an Asian nation, which is highly developed materially and technologically and whose people still hold to the principles of Buddhism,” His Holiness replied. “I’m honoured to meet you, members of the Japanese Parliament. Since I was a child I’ve admired democracy. After taking responsibility for Tibet in 1951 I started a reform committee, but it was not effective. The Chinese authorities, disregarding the fact that if we introduced reforms ourselves they would be suitable for Tibetan needs, did not want anything to stand in the way of their idea of reform. “In 1954, I went to Peking; in 1956 I went to India. During 1957 and 58 a crisis was brewing in Tibet that boiled over in 1959, leaving us no option but to escape. As soon as reached India we took steps to initiate the democratization of our administration. In 2001, we achieved an elected leadership and I was able to retire. In 2011, when another leader was elected, I confirmed my retirement. Not only did I retire, but I put an end to the custom of Dalai Lamas becoming the temporal as well as spiritual leaders of Tibet. “I appreciate your resolution about Tibet. Over the last 70 years since they occupied the country Chinese hardliners have tried different methods, the use of force, brainwashing and bribery to diminish the Tibetan spirit. But the greater the suppression, the stronger the Tibetan spirit grows. “There were all kinds of problems in Tibet before 1959, but there was no intrinsic conflict between the Tibetan and Chinese peoples. However, Chinese behaviour has created a rift between the two. Discrimination exists in the administration, schools and even in prisons. The Chinese government proclaims harmony and stability, but their policies completely undermine these goals. They need to be more realistic. “On our part, since 1974 we have not sought independence. We are prepared to stay with the PRC, provided we have all the rights we are entitled to. A few years ago, we noticed the existence of a thousand or so articles in Chinese supporting our Middle Way Approach (MWA) and critical of Chinese government policy. Today, there are at least 300 million Chinese Buddhists, many of them educated people with an appreciation of the value of the Nalanda Tradition. “I tell parliamentary groups who support Tibet in Europe that the more they are able to express concern from their own side about the situation in Tibet, the more it helps Tibetans and raises their morale. It encourages them to know there is support elsewhere in the world. It would be helpful if you were able to go into Tibet on an environmental fact-finding mission, accompanied by ecologists, to see for yourselves how things are. As you know, as the source of great rivers, Tibet’s ecology is crucial to Asian well-being. The resolution of the All Party Japanese Parliamentary Group for Tibet was formally read out in Japanese. Before leaving the meeting His Holiness indicated the Japanese and Tibetan flags standing together and told his hosts that when he was in Peking in 1954, Chairman Mao Zedong asked if Tibet had a flag. When he hesitantly told him it did, Mao replied, “Good, you must keep it. You can fly it alongside the Red Flag.” His Holiness told the meeting that with those words Chairman Mao gave his approval for the flying of the Tibetan flag, so there should be no room for anyone to complain about it afterwards. His Holiness returned to his hotel. Tomorrow, he will travel to Fukuoka on the island of Kyushu.